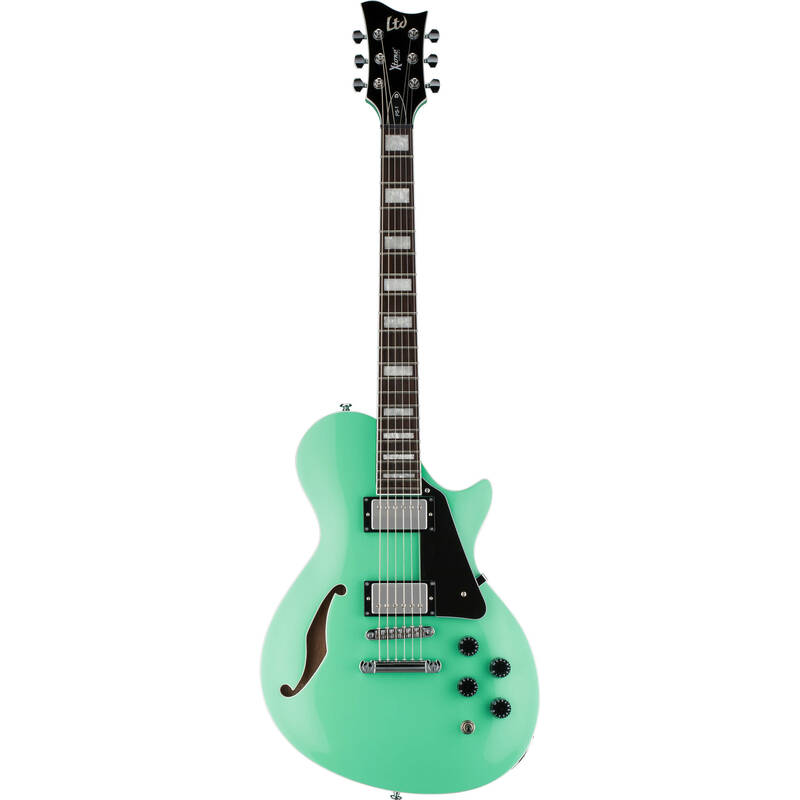 Styled in a sea foam green finish, the ESP LTD Xtone Series PS-1 is a single-cutaway, semi-hollow electric guitar with a chambered mahogany body. Its construction, features, and tone make it suitable for a wide variety of genres, including fusion, alternative rock, metal, and more. The instrument’s bolt-on maple neck offers a 24.75” scale, along with a roasted jatoba fingerboard and 22 extra jumbo frets. Strings are secured to the headstock with LTD tuners and attached to the body by means of a tune-o-matic bridge and stop tailpiece. For electronics, this guitar offers two passive ESP-designed humbucking pickups—the LH-150N in the neck and the LH-150B at the bridge. Independent volume and tone controls for each pickup are provided, giving you the ability to switch between a variety of timbres with the toggle switch. Sound and feel aren’t the only aspects to recommend this instrument; the look is also quite fashionable, with its tastefully eccentric shape, chrome hardware, and full binding on the body, neck, and headstock. Box Dimensions (LxWxH) 47.4 x 19.0 x 5.3"
LTD PS-1 Xtone Series Semi-Hollow Body Electric Guitar (Sea Foam Green) is rated 5.0 out of 5 by 1. Rated 5 out of 5 by Anonymous from Awesome deal and great color! You can't believe this guitar is only $400. It shipped much faster than the website said it would. I got in on the Thursday before Easter and played three sets at church on Easter Sunday. Sounds and plays great. Looks fantastic. Fit and finish are perfect.